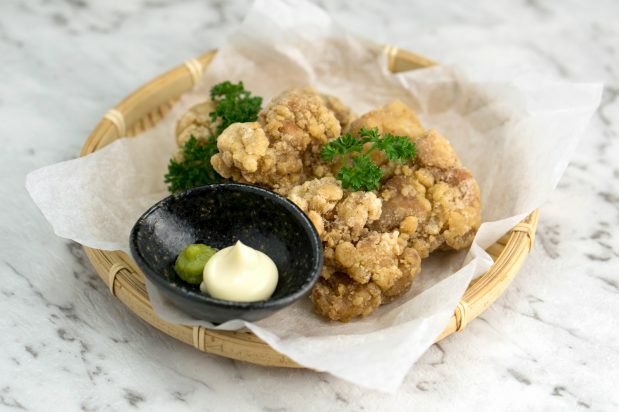 Cut chicken into bite-sized pieces, leaving a little skin/fat on for extra crispiness. Add Obento Japanese Soy Sauce, Obento Cooking Sake, egg, ginger and garlic in a bowl and mix well. Then, add the chicken, coat well and allow to marinate for 30 mins. Drain any excess liquid from the chicken and coat with potato starch. Heat cooking oil in a pan to 180°C. Fry 3-4 pieces at a time for 3-4 minutes until they are golden brown, then remove and allow to drain on a wire rack or paper towel. Mix S&B Wasabi Paste and Kewpie Mayonnaise. Then serve hot. For a savoury dip, try Obento Tonkatsu Sauce.